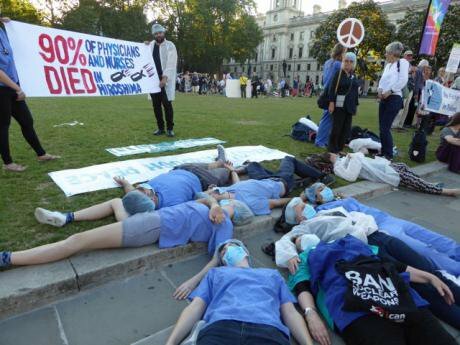 NHS workers oppose Trident renewal, Parliament Square 18 July 2016. Over 71 years after atomic weapons flattened the cities of Hiroshima and Nagasaki in 1945, leading to the development of over 50,000 nuclear weapons by ten nations, a majority of 123 UN Member states have voted to convene a multilateral UN conference in 2017 "to negotiate a legally binding treaty to prohibit nuclear weapons, leading towards their total elimination". Led by a broad cross section of nuclear free countries, including South Africa which eliminated its nuclear arsenal in 1991, their objective is to create a nuclear weapons prohibition regime under International Humanitarian Law. Their intention is to accelerate the abolition of today's nuclear arsenals of over 15,000 weapons, reduce the proliferation-driving value attached to these weapons of mass destruction, prevent nuclear detonations and deter further modernization and proliferation. Building on the 1968 Non-Proliferation Treaty (NPT), the new multilateral treaty will for the first time provide a comprehensive approach to prohibiting activities such as the use, deployment, production, transporting, stockpiling and financing of nuclear weapons. It will also extend the NPT's nuclear disarmament obligation by creating a clear, unequivocal legal obligation to eliminate existing arsenals that will apply to non-NPT as well as all NPT states. The UK was among 38 states that voted against negotiating such a treaty, though diplomats privately acknowledged that they were in a weak position to stop negotiations from going ahead. A further 16 governments decided to abstain. If the UN First Committee vote is confirmed by the UN General Assembly in December, as is likely, the negotiations will go ahead, with sessions timetabled for March, June and July 2017 in New York. The resolution for "taking forward multilateral nuclear disarmament negotiations", which was led by Austria, Brazil, Ireland, Mexico, Nigeria and South Africa, with 57 co-sponsors, calls for the negotiations to be open to all UN Member States, in accordance with General Assembly rules of procedure, which means that if consensus cannot be achieved, decisions are taken by majority. Relevant international organisations and civil society will be actively encouraged. All states will be encouraged to participate, but none will be given a veto power to block the negotiations or decisions. This makes it possible to envisage a nuclear ban treaty being delivered in time to be adopted by the United Nations at a high level meeting in 2018, as some states have already advocated. 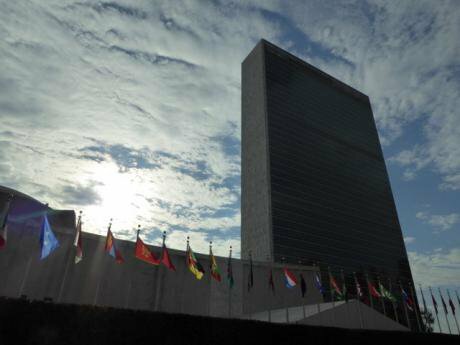 This UN vote and next year's negotiations look set to be a huge game-changer. So why is it being ignored by mainstream British media? As noted by a handful of forward-looking Green, Labour and Scottish MPs during last July's Trident debate, a nuclear ban treaty is better for UK security than spending over £205 billion on upgrading Trident and threatening to fire it at Moscow or wherever, as Theresa May currently advocates. 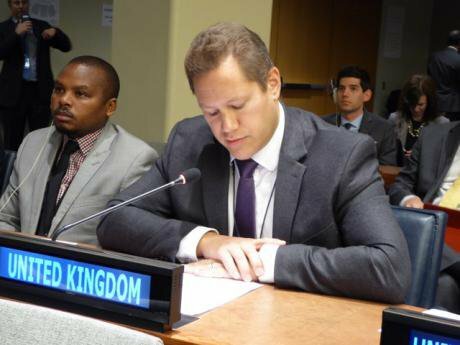 In two speeches given by UK ambassador Matthew Rowland on 14 October, the tone was anxious and hectoring, as this desperate British diplomat pleaded with his non-nuclear peers to join him in voting against a resolution that he knows the UK will not be able to avoid or withstand. Still he proclaimed that "as long as nuclear weapons exist NATO will remain a nuclear alliance" and that the UK intends to have nuclear weapons for "the foreseeable future". Even in NATO countries, however, those assumptions are being questioned and criticised. Weeks before the UN vote, the Norwegian, Dutch and Belgian parliaments strongly argued for their governments not to oppose the resolution or negotiations, though only the Netherlands had the courage to defy the NATO whip and abstain. In a further development initiated by European Greens, MEPs supported a European Parliament resolution that called for EU governments to participate constructively in the proposed UN multilateral negotiations "to prohibit nuclear weapons in 2017 ". Backed by 415 MEPs, this EP resolution also invited "Vice-President/High Representative Federica Mogherini and the European External Action Service to contribute constructively to the proceedings of the 2017 negotiating conference". Only 124 MEPs voted against, mainly from the far right parties, with 74 abstentions. Though non-binding, the EP resolution is significant for having situated efforts to prohibit and eliminate nuclear weapons in the context of nuclear security and nonproliferation, dismissing arguments from Russia and various NATO states that prohibiting nuclear weapons would somehow undermine nonproliferation and security. The Japanese government's decision to vote against the UN resolution for multilateral negotiations to ban nuclear weapons came under heavy criticism from parliamentarians, religious groups and civil society, most notably the Hibakusha survivors of the Hiroshima and Nagasaki atomic bomb attacks. Despite voting against, Japan has promised to participate in the negotiations when they are convened. Russia, whose "disturbing… rhetoric about the use of nuclear weapons and the frequency of snap nuclear exercises" was cited by the UK's Ambassador Rowland as a major reason for the UK to oppose the resolution, was on the same side as the US and UK in wanting to carry on having nuclear weapons to use, deploy and project power with. Russia appeared dismissive of the security interests of countries who wanted to ban nuclear weapons when they don't have any. Several African and Latin American diplomats reported that Russia was especially active behind the scenes in evoking its weapons and assistance in past proxy wars in efforts to persuade their governments to oppose the multilateral disarmament negotiations. On 24 October, 15 Nobel Peace Laureates joined Nobel science Laureates in an open letter. This emphasised the "need to stigmatize, prohibit and eliminate nuclear weapons" and called for nuclear prohibition negotiations to be concluded quickly so that "we can move rapidly towards the final elimination of this existential threat to humanity". Unconsciously or deliberately, US Ambassador Robert Wood echoed them: “How can a state that relies on nuclear weapons for its security possibly join a negotiation meant to stigmatize and eliminate them?” What, then, was President Obama's claiming to want when he advocated 'the peace and security of a world without nuclear weapons' in his 2009 Prague speech? Eight years on from receiving his premature Nobel Peace Prize in 2008, Obama's policies have embedded nuclear modernization and expenditure more deeply than ever. That's why this UN vote is so important. It moves diplomatic and legal action beyond the veto power of nuclear-dependent governments that want to keep their privileges under the NPT. It came as no surprise that the US, UK, France, Russia and Israel voted against, with most of NATO, Australia and Japan. But they can't block the process that the UN has now launched. Interestingly, North Korea voted for negotiations to ban nuclear weapons, while China, India and Pakistan abstained. United Nations Headquarters, New York, October 2016. Looking forward, what does this mean? Negotiations will go ahead in 2017, unless the nuclear-armed states that are permanent members of the UN Security Council unite to derail it, which no longer appears very likely. Since 2013 they have tried ignoring, misrepresenting, arm-twisting, pleading and threatening. Now they have a choice whether to boycott the negotiations, in the knowledge that the non-nuclear nations can bring a nuclear ban treaty into force with or without them, or participate in hope of weakening the outcome to fit their nuclear interests. But history demonstrates that even if they decide not to accede to the new treaty, the norms and prohibitions will percolate into their nuclear decision-making. The UN vote is the product of civil society initiatives working in partnership with a core group of states on a strategy that has met its first phase objectives in six years. Over 440 organisations in 98 countries joined the International Campaign to Abolish Nuclear Weapons because they were convinced by our arguments that irreversible nuclear disarmament would be more effectively achieved by prohibiting nuclear weapons as soon as possible, thereby creating new norms and legal requirements to reinvigorate a range of disarmament processes. ICAN and our partners may be celebrating this UN vote, but we are already focussing on what we want to see in the nuclear ban treaty, and how the provisions will help governments and civil society to implement further steps have been paralysed or stymied for many years, including the "thirteen steps" adopted by NPT states in the 2000 NPT Review Conference, and relevant steps advocated by arms controllers and Global Zero for total elimination, verified and monitored through an appropriate form of nuclear weapons convention when that becomes feasible. As for the UK, the nuclear ban treaty in the pipeline makes Trident renewal completely untenable, notwithstanding the posing for cameras by Defence Secretary Michael Fallon as he "cut steel" for four new nuclear submarines after the Ministry of Defence signed further multibillion pound contracts with BAE Systems. Prime Minister Theresa May may want to boycott the UN negotiations, but Labour Leader Jeremy Corbyn, who attended the Vienna Conference, has now appointed a Minister for Peace and Disarmament, Fabian Hamilton MP, who said that one of his main roles will be to participate in the UN multilateral disarmament meetings. Similarly, the Scottish government is arguing for a seat at the UN negotiations, arguing that they have special interests as a country forced to host nuclear weapons against the will of the majority of Scotland's people. In accordance with past experience, ranging from the Comprehensive Test Ban Treaty, the Mine Ban Treaty, and the Cluster Munitions Convention, among others, the UK's attempts to prevent negotiations going ahead will soon make way for tactics to derail, dismiss, obstruct and undermine a constructive outcome. When a nuclear prohibition treaty is concluded, however, the UK will soon sign, though without much enthusiasm, and try and save whatever they can from the Trident fiasco. And in a few years UK politicians and diplomats will probably take credit for the treaty as a long-standing British objective.